Athenahealth reports Q2 results: revenue up 15 percent, adjusted EPS $0.51 vs. $0.34, beating expectations for both. ATHN shares rose 7 percent in after-hours trading following the announcement. They’re up 15 percent in the past one year and 54 percent in the past five, but both significantly trail the performance of the Nasdaq index. The company’s market value is $5.7 billion. Co-founder, CEO, and board chair Jonathan Bush holds shares worth about $45 million. 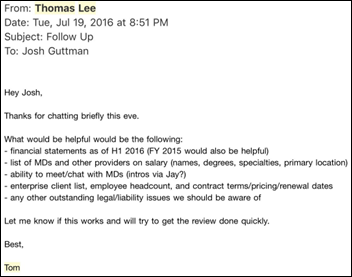 From e(x)HMP: “Re: David Waltman’s golden parachute at Cerner. Not the first time he has found a way to fail upwards. He represents everything that is wrong with the VA/VistA fiasco. By all means, let’s give this guy a third shot.” The reader linked to a 2013 story about the VA’s $162.5 million contract award to ASM Research to improve the user experience with VistA, triple the price offered by two competitive bidders. One month later, the VA’s David Waltman – who had worked on the contract as chief UX architect of the iEHR project – announced that he would be leaving to take a chief strategy officer job with Accenture-owned ASM. ASM’s subcontractor in the project was Agilex, which had hired former VA CIO Roger Baker. Waltman lasted only nine months at ASM before going back to the VA as chief information strategy officer. Baker worked two years for Agilex, which was then also acquired by Accenture. From Soft Machine: “Re: Teladoc and Analyte Health. Definitely headed toward covalent bonding. 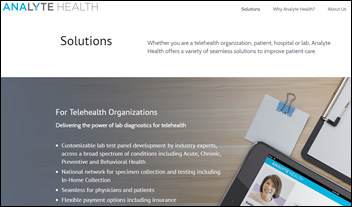 What do you make of them?” Analyte Health offers telehealth providers lab ordering, specimen collection, and testing services. The CEO is industry long-timer Kevin Weinstein, who was chief growth officer at Valence Health through its acquisition by Evolent Health. 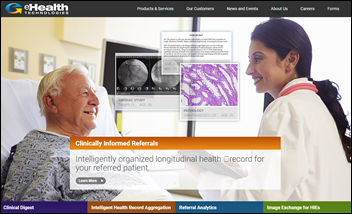 Teladoc and Analyte health announced a partnership in January 2017. Being a hospital guy, I’m not crazy about Teladoc’s model since I can’t fathom why hospitals don’t launch their own branded telehealth service with their own doctors and keep patients within their system (no different than retail clinics), but TDOC shares have doubled in price in the past year to a $2 billion market cap, giving the company money to use for acquisitions. 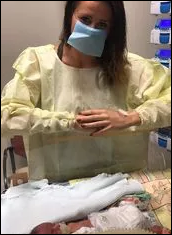 Analyte Health would be a significant differentiator since many telehealth encounters involve an awkward lab test handoff and having integrated lab services opens the door to offering services for conditions beyond the usual rashes and ear infections. Hospitals that compete with or are indifferent to Teladoc might like working with Analyte Health since it doesn’t run its own labs – it contracts with hospitals and commercial lab providers and thus could steer business to the hospital lab. From Aging Programmer: “Re: your HIT index. Loved it! I scored myself and got an 82. The main potential issue I see is the definition of management – maybe it should be managing at least five employees, in which case my score drops to 67. Ironically, my consulting time had almost as much impact as my CMIO experience, but I know there’s a lot of dead wood consultants out there.” I reviewed AP’s LinkedIn and I think his very high score of 82 seems about right given his medical education and extensive provider experience that emphasized informatics. I thought about trying to define the scope of management, but the only person who would know that is the individual since LinkedIn only lists titles, so I think you get points for title regardless of actual responsibility. 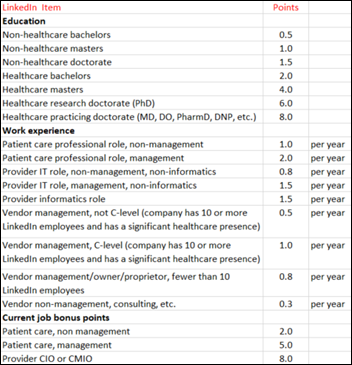 In comparison, quite a few of the “most influential” folks would score in the low single digits with no healthcare-related education or significant health/health IT work experience. I’m certain many of them would protest that their speaking engagements, unpaid advisory board participation, and blog posts should boost their scores, but I don’t see how those necessarily qualify someone to render analysis and opinion. Nobody pays much attention to what armchair quarterbacks and barstool coaches think about football. From Can Spam: “Re: Athenahealth turnover. The amount of churn is remarkable. Since 2015, they’ve lost their chief technology and product officer, COO, two CFOs, and the VP who was instrumental in building AthenaNet. Likely more to come given the involvement of activist investor Elliott Management.” Investors have reacted positively to Elliott’s involvement (as they often do), although customers should probably be less enthused since it’s not necessarily in their best interest to have the company sold or broken up into more lucrative pieces. 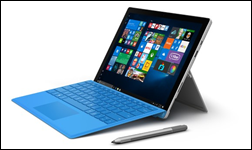 We’ll be missing Dr. Jayne’s regularly scheduled post tonight as she struggles (yet again) with the Microsoft Surface she unwisely purchased that seems to have given her constant problems since. This time a software update killed it. 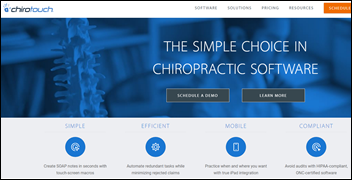 This week on HIStalk Practice: Waud Capital Partners acquires ChiroTouch. Nebraska HHS, HIE work with DrFirst to advance PDMP. Cow Creek Health & Wellness Center rips and replaces with help from Greenway. Solo family physicians advocate for low-cost, easy-to-use patient-generated data tools. New CDC director takesTwitter for a spin. Carolina Center for Occupational Health goes with Bizmatics HIT. Tom Lee, MD hands over One Medical reigns. North Carolina health officials find themselves in hot water due to a trail of data entry oversights. 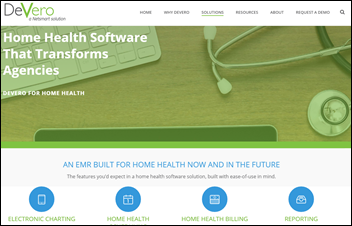 Netsmart acquires home care and hospice software vendor DeVero. The State of New York provides $2 million in tax breaks to electronic referrals vendor EHealth Technologies, which will expand its 215-employee Henrietta operations in adding 160 full-time positions in the Finger Lakes area. EHR security tools vendor Protenus raises $3 million in an extension of its Series A funding round that has raised $7 million. In the United Arab Emirates, Emirates Hospital — owned by UAE-based investment group KBBO – buys a 60 percent position in Dubai-headquartered MD 24-7, which offers online and face-to-face wellness and concierge services. 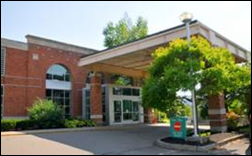 Medical Associates of Clinton, IA chooses EClinicalWorks 10e cloud-based EHR for its 49 providers. PokitDok hires Joe Murad (Willis Towers Watson) as CEO and board member. He replaces co-founder Lisa Maki, who remains on the company’s board. AHIMA announces in a member email that CEO Lynne Thomas Gordon’s last day was July 15, although it did not provide a reason for her departure. A search for her replacement is underway. Home care software vendor HHAeXchange promotes Greg Strobel to president and CEO. Founder and former CEO Raphael Nadel will become chief innovation and strategy officer. Missy Krasner (Box) reportedly joins Amazon in unannounced healthcare role. 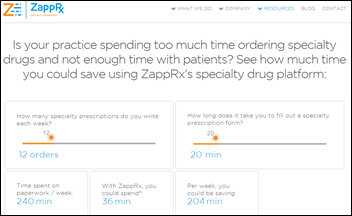 Arizona Pulmonary Specialists (AZ) and Harbor-UCLA Medical Center (CA) go live on ZappRx’s specialty medication drug prescribing platform, with the director of Harbor-UCLA’s pulmonary hypertension center saying its first prescription was approved within 48 hours vs. the common paper-based process that sometimes took more than three weeks. 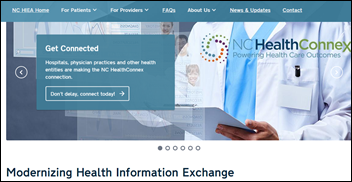 Three of North Carolina’s largest health systems – Novant Health, Carolinas HealthCare System, and Duke Health – will connect to the state-operated HIE NC HealthConnex, which also announced that the Coastal Connect regional HIE will join. Seventy-bed Jones Memorial Hospital (NY) and two other hospitals affiliated with UR Medicine receive a $5.7 million state healthcare transformation grant to replace Meditech and LSS with UR’s Epic system. 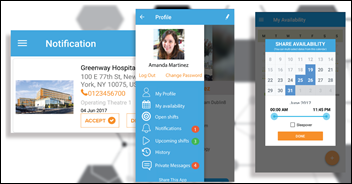 In Ireland, a former hospital CEO develops CliniShift, a staffing app that allows a hospital to match its vacant shifts with available staff. It also tracks the status of credentials and allows managers to monitor how the app is being used. The company expects to begin a pilot project at an unnamed large hospital on the US East Coast in September and has opened an office in Boston. Meditech announces that it will offer CommonWell interoperability services in early 2018. Change Healthcare joins the Hashed Health blockchain technology consortium. Japan will take “strict action” against drug maker Bayer, which acknowledges that three of its employees inappropriately accessed survey-generated patient data to plan a promotion for the company’s Xarelto blood thinner. 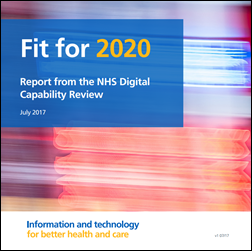 Fortified Health Security releases its mid-year cybersecurity report. Sherpaa founder Jay Parkinson, MD, MPH blasts the venture capitalists who funded his company, then tried to liquidate it given the inherent disconnect between the VC desire to quickly scale and sell out vs. the “glacially-moving industry” of healthcare. 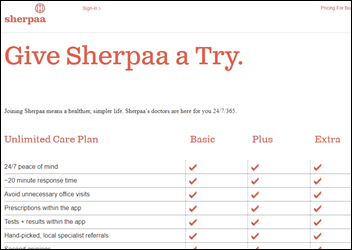 Sherpaa’s handful of employed doctors offer online-only routine primary care encounters, charging individual customers $270 per year for unlimited app visits 24×7, which includes managing prescriptions, lab tests, referrals, and second opinions. Parkinson said the investor made himself CEO and then fired all the staff, including the doctors who could not legally stop seeing patients without giving them advance notice. He also accuses the investor of sending the company’s primary competitor, One Medical, its client and payments list in unsuccessfully trying to sell the company. The investor/CEO and board finally resigned a year ago and left the company’s remains for Parkinson to revive, but Parkinson says One Medical’s sales team then used Sherpaa’s proprietary information to badmouth it and to undercut Sherpaa’s employer rates. It’s an interesting idea and certainly cost-effective given the expense and overhead of arranging a PCP visit, but I would have to wonder how the VC was pitched in the first place. The company requires no upfront fee or ongoing commitment, so anyone who wants to give it a shot only has to pay the the first month’s $25 and then request a visit. I’m not sure how their doctors handle prescribing across state lines or how they manage referrals that are within the customer’s insurance network. An insightful editorial says it’s counterproductive to call someone who is experiencing g a horrible disease – specifically Sen. John McCain – a “fighter” since the “warrior rhetoric” doesn’t improve their outcomes and can cause them to feel that they’re letting people down if they struggle or if they wisely choose palliative care instead of suffering through more rounds of painful treatments that offer little chance of success. A Cancun, Mexico hospitals refuses to allow a premature baby to be transported back home to the US until the parents pay $30,000. That solved Mexico problem preceded the inevitable US one – the grandparents paid $18,000 for air transport to a Florida hospital that refused to accept the baby because of the mother’s Indiana Medicaid insurance, so now they’ll have to pay another $30,000 to get him to Indiana. Liaison Technologies awards its first data-inspired Future Scholarship to high school graduate Antonio Ferris of Mesa, AZ. Santa Rosa Consulting is named a “best place to work”by Modern Healthcare for the sixth consecutive year . Optimum Healthcare IT is named one of the 50 fastest-growing companies in Northeast Florida for the second straight year. LogicWorks partners with CloudHealth Technologies to optimize cloud management and performance. Meditech will exhibit at the AHA 2017 Leadership Summit July 27-29 in San Diego. Obix Perinatal Data System, developed by Clinical Computer Systems, will exhibit at the AWHONN Florida Section Conference July 27-28 in Ponte Vedra, FL. Experian Health receives the 2017 MongoDB Innovation Award in the healthcare category. PatientSafe Solutions joins the Integrating the HealthCare Enterprise as a member organization. Integrity is out the window these days. No one has held Waltman accountable. No one is complaing to Cerner and they surely aren’t being held accountable as they prepare to name their own price on their no-bid handout. The market will be numb and apathetic until this is forgotten in a few weeks. Save the link for when Waltman jumps ship to chase the next buck in a couple years. Another Re: your HIT index: I’m a clinician who has worked in HIT for 17 years. Your rating scale made me wonder about all the HIT Vendor Sales Execs and how their parent company ’titles’ them. For example, many non-management sales execs are given titles like Regional Sales Manager or Regional Sales Director or Director or even VP when, in fact, they’re ‘just another sales guy/gal’ and they don’t manage anyone (much less themselves in many cases!) I’m wondering how these guys/gals might assess themselves on your index and whether this ‘bloat’ will skew the index. Or perhaps you already considered this? Given the political hot potato the VA unfortunately is you have to think at some point Cerner’s name fair or not will be dragged in to the debate.